Happy Valentine's Day! Mine was full of sugar, some learning, some fun, and more sugar. And now for the crash... except we are packing to go to Wisconsin Dells after work tomorrow, so I can't crash. Also I should run on the treadmill to burn off some of the sugar. We shall see if that happens. I gift my Zombie fans with the lovely video above. Our Pennies for Patients fundraiser was an enormous hit. We creamed the previous years' totals of $10K and $11K and raised over $14K this year!! Amazing. A big shout out to one infamous coworker who pledged to shave her head if we hit $12K (which we did) and more amazing coworkers who dressed up in silly costumes (i.e. Minions) and others who slept in tents on the roof of the school after their totals were surpassed. 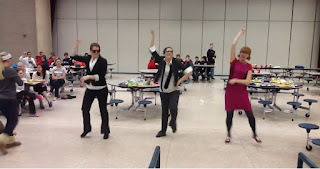 I replied to a group email saying, "sure, I'll dance the Gangnam Style at lunch", assuming there would be lots of other teachers to sign up with me. Nope, just two... so the pressure was really on when the students hit the $6,000 goal. We practiced and practiced until our calves ached. The plus side, I didn't have to run for three days! And the result was exceptional hilarity at each of the 4 grade level lunches. That's me in the pink.